I'm still in the process of going through this little stock pile of records that people have sent me to review. It's a good thing I have them as it's been kind of a slow start to the new year for new records coming out that I want to buy. A lot of times when someone sends me a record, I have no idea why they sent it and at times I question if they have ever read anything on my website. 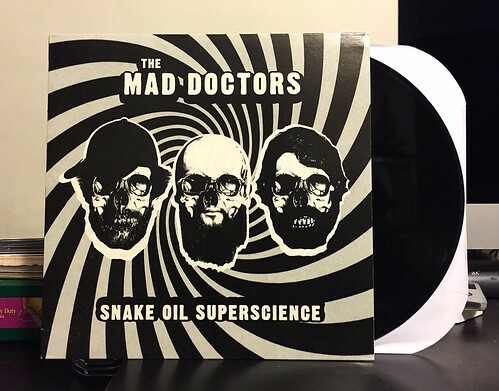 I can't say for sure, but The Mad Doctors are much more up my alley than the typical band-I've-never-heard-of records that occasionally show up at my door. I get the feeling that someone involved with this band or record label might actually read this website every so often. The Mad Doctors are playing a version of 60's influenced garage rock. Their guitars are absolutely soaked in reverb and tremolo, giving the band a vintage, but otherworldly sound. There are strong hooks, interesting guitar leads and a good showing of energy that makes Snake Oil Superscience an easy record to pop on the turntable for a spin. My major criticism of the band is that I really don't like the way the vocals were recorded. Based on the type of music they are playing and the general tone of the entire record, I'm sure the vocals were an aesthetic choice. I am, however, a little sick of the super fuzzy, recorded-in-an-abandoned-cave-somewhere vocal effect. I think the songs are strong enough to stand up to cleaner production and not be hidden behind a wall of static. This certainly isn't the best or most original album I have ever heard, but it's definitely one of the better records that someone has mailed to me to check out. Due to my issue with the vocals, I'm not sure that this is the sort of thing that I'll end up playing that often, but if garage rock is your thing, specifically if you like some scuzzy vocals, The Mad Doctors are worth checking out.